We can promise you this much — you won't be bored! he Little Rock Zoo welcomed two new elephants, Sophie and Babe, who arrived Monday (Oct. 21) from the Niabi Zoo in Coal Valley, Ill.
Little Rock Trojans Baseball at Gary Hogan Field: Thanks to a generous donor, all youth baseball players can get a free ticket to attend the Trojans baseball game this Friday! The Trojans play against Coastal Carolina at 6 p.m. For more information or for tickets, contact Seth Jones at 501-690-0401 or sajones3@ualr.edu. Race for a Healthier Tomorrow at Arkansas Children’s Hospital: The inaugural Race for a Healthier Tomorrow is a timed 5K and 1-mile fun walk that benefits the ACH Auxiliary. The fun begins at 8 a.m. on the hospital campus in Little Rock. There will be prizes, medals, a fun fair, fundraising awards and more! Registration is $10 for kids and $25 for adults. Visit the website for more info. The Big Catch Fishing Derby at MacArthur Park: The entire family can enjoy a day full of fun, food, games and prizes from 8 a.m.-1 p.m. Activities include archery, BB gun shooting, a community health fair, fish cooking demonstrations and more! Bring your own fishing gear and lunch will be provided. Visit the website for more info. FREE! Breakfast with the Easter Bunny at Dave & Buster's: Join Dave & Buster’s in Little Rock for Breakfast with the Easter Bunny. Breakfast buffet includes eggs, sausage, bacon, fruit, bagels and more. Every attendee gets a $10 power card to play games as well as a photo with the Easter bunny, goody bag, crafts and time for an Easter egg hunt! Tickets are $23.86 and the fun goes from 9-11 a.m. Click here for more information. Knight & Princess Camp at ArtLab: Little knights and princesses will create arts and crafts fit for royalty! A real-life princess will even make an appearance during this day full of fairytales and magic. The event goes from 10 a.m.-noon and is recommended for ages 3 and up and pre-registration ($55) is required. Visit the website or call 501-379-9175 for more details. Easter Egg Hunt at Excell Park in Jacksonville: Bring a basket to Jacksonville’s largest Easter egg hunt! Toddlers through age 10 participate in this holiday tradition in a fun and safe environment. All participants must arrive by 10 a.m. The Easter bunny will make a special appearance and egg hunts include 2,000 eggs per group! The schedule is: toddlers (field 2) at 10:15 a.m.; ages 4-5 (field 3) at 10:30 a.m., ages 6-7 (field 2) at 10:45 a.m., and ages 8-10 (field 3) at 11 a.m. In case of rain, all ages meet at the Jacksonville Community Center at 10 a.m. For info call 501-982-4171. FREE! Easter Bunny Photos at Laman Public Library: Kids can meet the Easter Bunny and pose for photos at this free event! Hop right over when the doors open at 10:30 a.m. Call 501-772-9600 for more details. FREE! Pollination Station at Heifer Hour: Kids in kingergarten through fifth grade can head down to Heifer Village & Urban Farm to learn about bees and pollination! The free event goes from 11 a.m.-noon. Click here for more details. FREE! Easter Bunny Photos at The Promenade: Visit with the hoppiest rabbit in town – The Promenade Easter Bunny! Meet at the fireplace next to Bravo Italian from 11 a.m.-2 p.m. and remember to bring a camera for free photos with the bunny. Maggie Moo’s Ice Cream & Treatery will be giving the first 100 kids a free gift. Pets are also welcome! Call 501-821-5552 for more information. FREE! 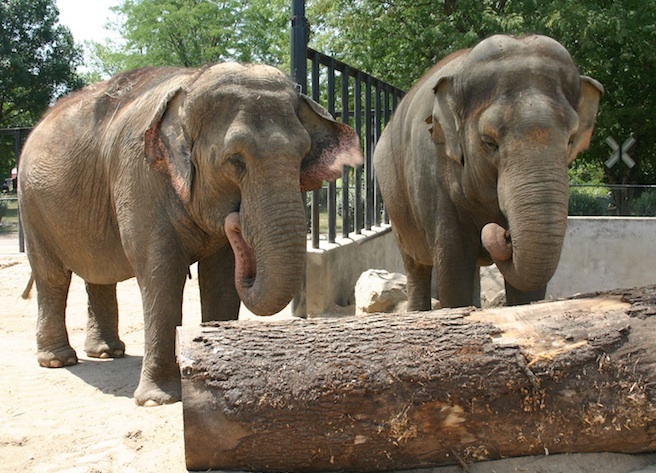 Sophie the Elephant's 50th Birthday at the Little Rock Zoo: This special celebration for Sophie the elephant will include custom enrichment items and a cake made out of Sophie’s favorite treats. Guests enjoy birthday cake as well as help prepare gift sacks and hide them in the elephant yard for a fun game of treat hide and seek. The party, from 1:30-2:30 p.m., is beach themed, so don your bright colors and sunglasses! Regular Zoo admission applies. Click here for more information. Star Party at Pinnacle Mountain State Park: Peek through a telescope and into the night sky! Join members of the Central Arkansas Astronomical Society to view the rings of Saturn, the surface of the moon, or even distant galaxies. This is a come-and-go style event from 7:30-10 p.m., but arrive at 7:30 p.m. for a brief audiovisual presentation of current celestial happenings. Call 501-868-5806 for details. FREE! Jewish Food & Cultural Festival at War Memorial Stadium: Enjoy traditional Jewish food such as corned beef sandwiches and cabbage rolls as well as Israeli dishes like falafel and hummus at this free festival! Visitors are asked to bring non-perishable food items to donate to the Arkansas Foodbank; any proceeds from the festival go to benefit Jewish Federation of Arkansas’s work in the community. The fun goes from 9 a.m.-4 p.m. Click here for more info. Admission is FREE! Super Sunday Free Family Funday at the Arkansas Arts Center: Stop by the Arts Center anytime from noon-3 p.m. for a free afternoon of educational and crafty fun. Participants will get to create an Andy Warhol-inspired project and choose from several pre-burned silk screens and try their hand at printing onto paper. Click here for more details. FREE! Arkansas Travs Opening Weekend at Dickey-Stephens Park: The Arkansas Travelers play a seven-game series against the Tulsa Drillers to kick off the 2019 season! Bounce Houses, trackless train, mascots and entertainment every night make it a great place for a family outing. Friday's game starts at 7:10 p.m., Saturday's game starts at 6:10 p.m. and an afternoon game on Sunday starts at 2:10 p.m. Tickets start at $6. Visit the Travs website for more info. Easter Family Fun at Bass Pro Shops: Families are invited to celebrate Easter at Bass Pro Shops by enjoying free photos with the Easter Bunny, crafts for the kids and an old-fashioned Easter egg hunt. Photos take place Saturday 11 a.m.-6 p.m. and Sunday noon-5 p.m. Crafts take place Saturday noon-5 p.m. and Sundays noon-4 p.m. Call 501-954-4500 or visit the website for more information. FREE!